We start with one that makes a bit of sense. 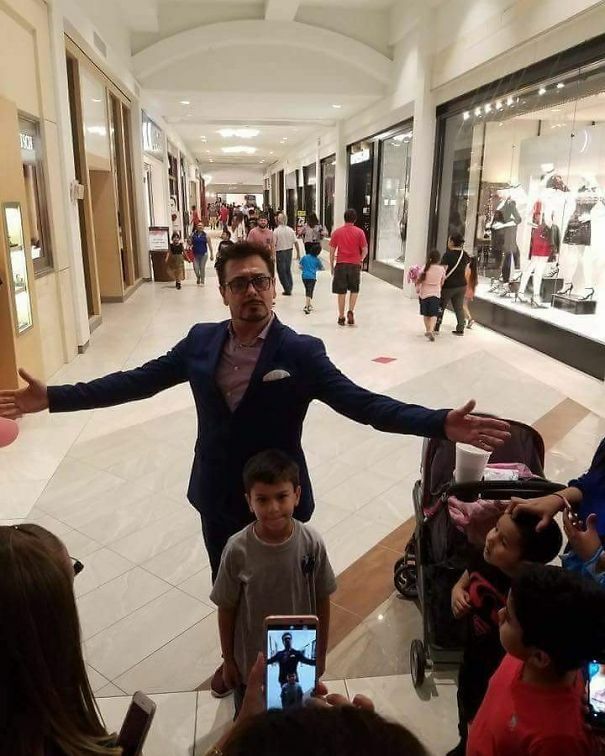 This guy has facial hair that resembles Robert Downy Jr., as well as an outfit that is very close to the ones worn by Tony Stark… His flamboyant pose only adds to the understandable mistake by these folks. It’s possible that this is the closest resemblance to the real celebrity. 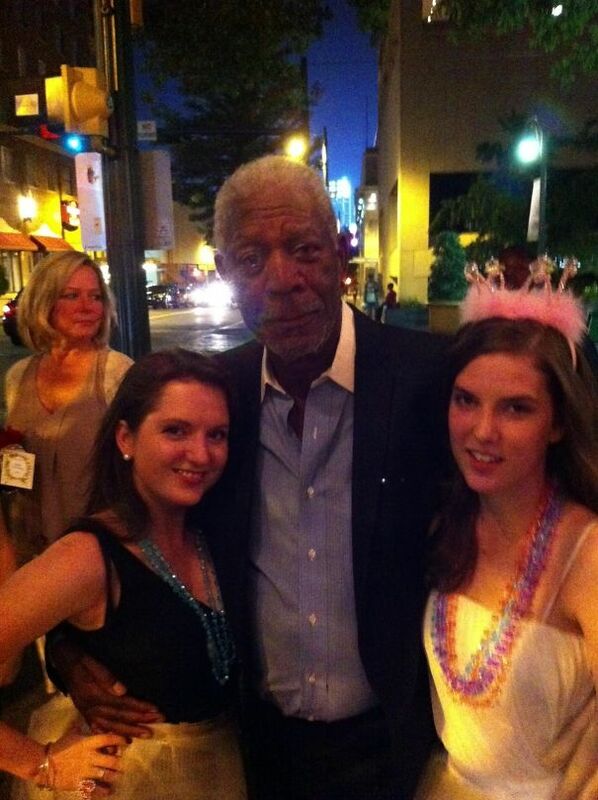 This guy really, truly looks like Morgan Freeman. It is completely reasonable that they made this mistake and even now, I’m not even entirely sure it was one. 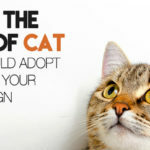 There might not be a worse case of mistaken identity on this list. 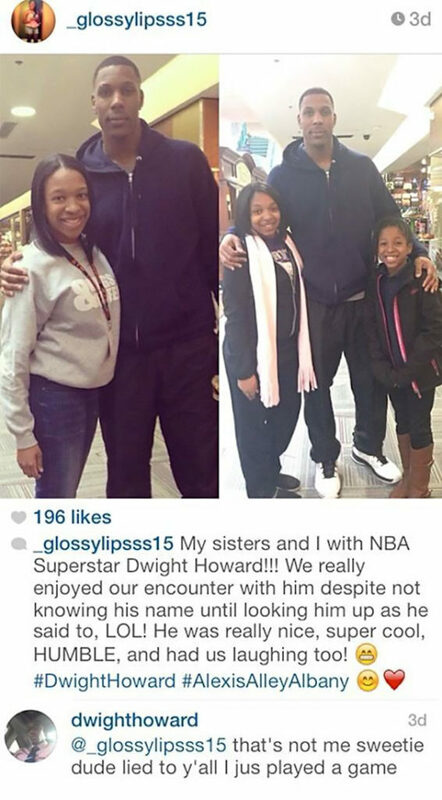 These girls thought they had bumped into NBA player Dwight Howard. He looks nothing like Dwight and is nowhere near as big as the 6 foot 11 player. Dwight commented on the photo to explain that he was actually playing a game at the time it was taken. I don’t know if this person was ever told he looked like a celebrity before. 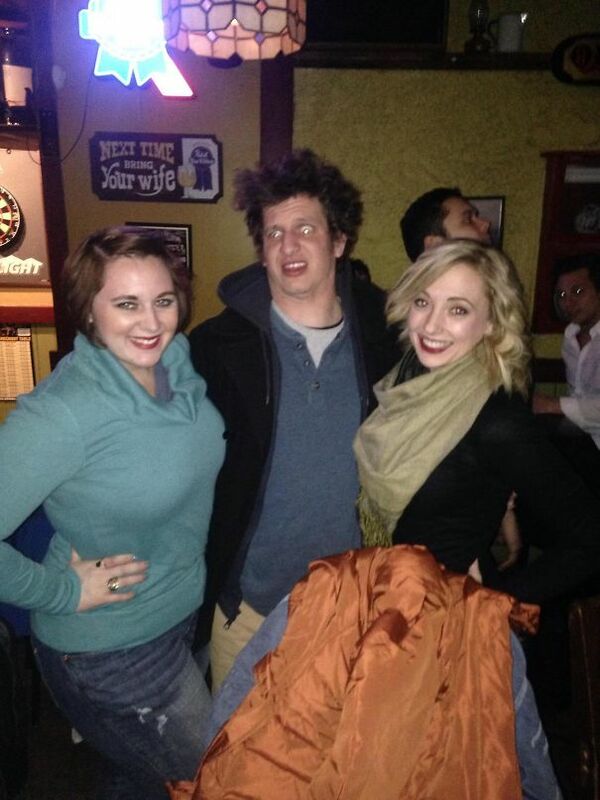 Apparently, these ladies thought he was Andy Samberg. He seems a bit confused by it all, but went right along with it and took a bunch of photos with them. He calls this one the best photo he’s ever taken. Okay, this one is kind of close. 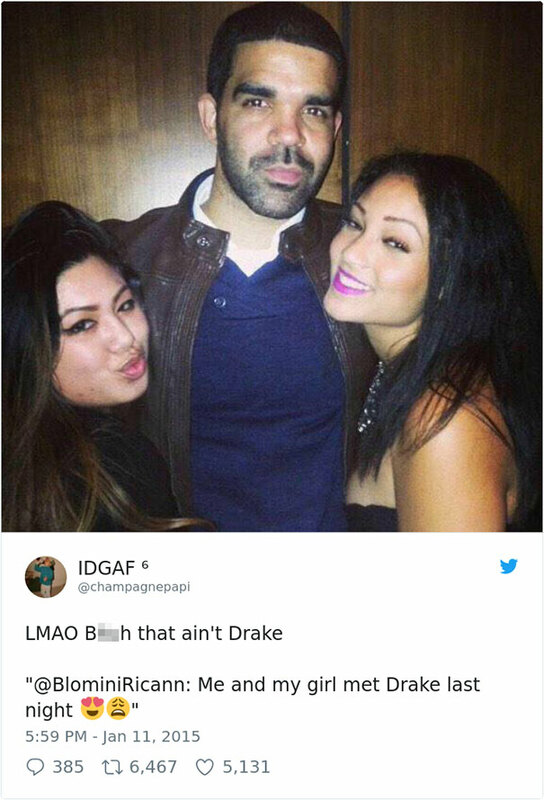 At first glance, these girls seem to have met the former Degrassi actor and massive rap star, Drake. If you scroll past it quickly, it’s believable. But, after a few seconds, it’s clear it’s not him. 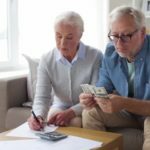 Here’s another one that ranks among the more understandable on this list. 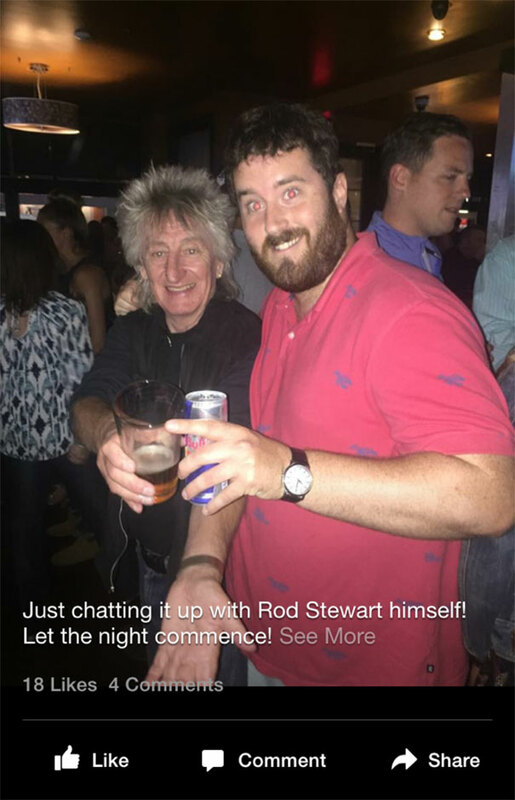 Someone thought he was hanging out and having a good time with Rod Stewart. He even posted about what a great night it could end up being and I don’t think many people corrected him. These women made the mistake of thinking this guy was Johnny Depp. I mean, maybe if Depp was on some kind of drug or something like that. 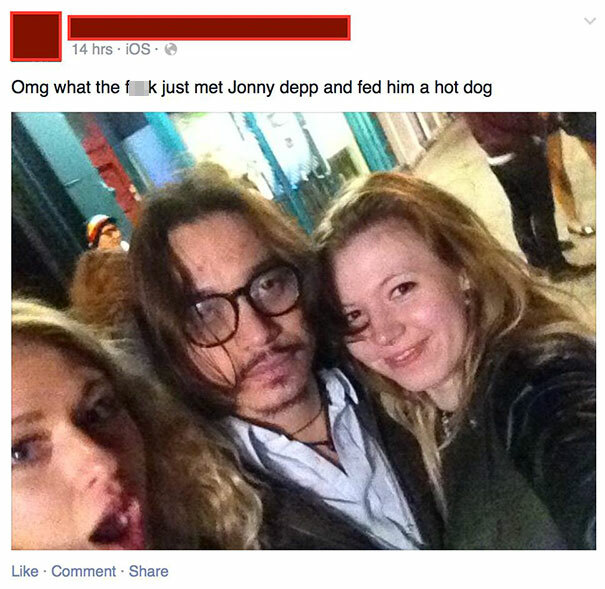 He looks absolutely lost that someone would think he’s Depp, but at least he got a free hot dog out of the ordeal. At least this person explained that he was drunk when this happened. 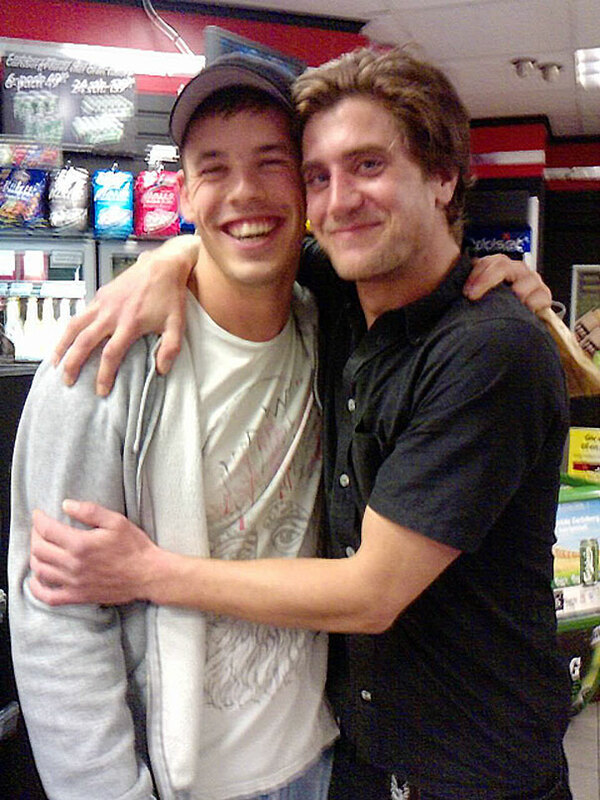 He mistook this guy at a convenience store for Jake Gyllenhaal. In reality, the guy looks more like Gyllenhaal crossed with Robert Pattinson. The guy who made the mistake says he’s now 90% sure it wasn’t the celebrity. More like 100%. Another person who admitted to inebriation being the cause of their place on this list. 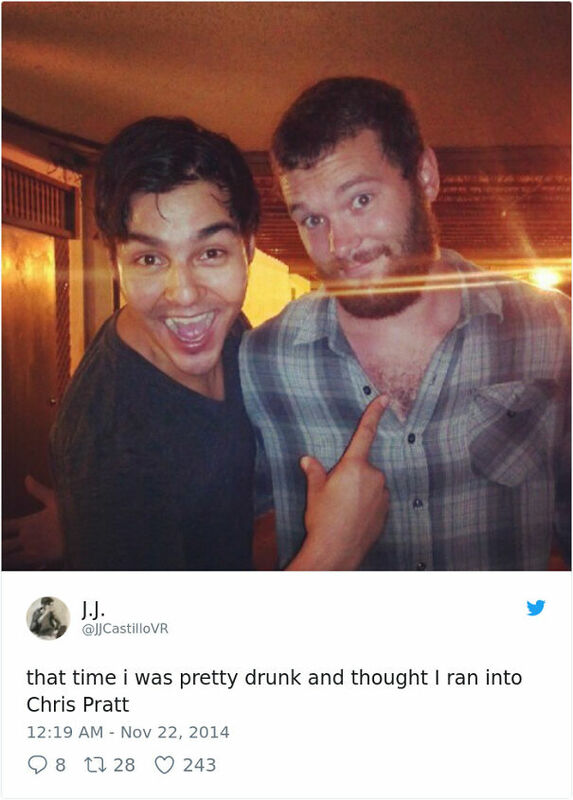 This guy tweeted out that he was pretty drunk and he believed he had met Guardians of the Galaxy star Chris Pratt. However, this guy was far from Mr. Pratt and a sober look shows that. Ed Sheeran lookalikes are all the rage. You can seemingly ind them everywhere. Ed Sheeran himself has gone out of his way to post about them often. 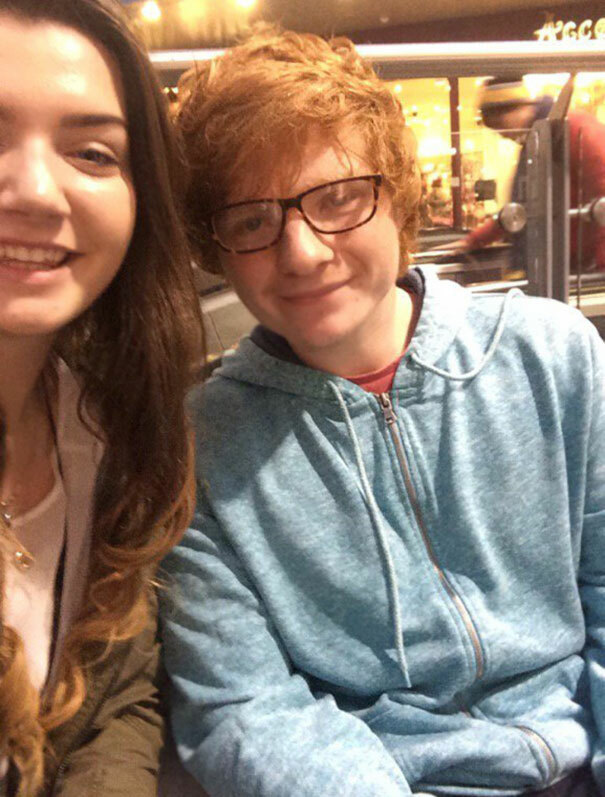 This guy does look a lot like Ed. He might as well be the singer’s little brother. 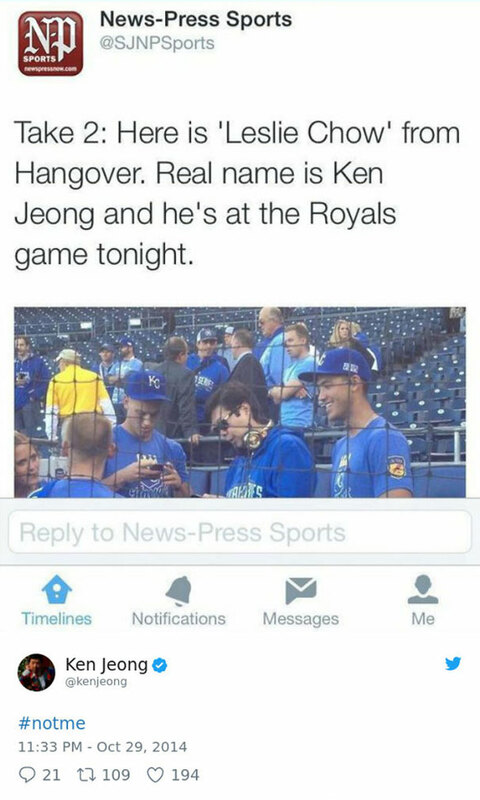 At a Kansas City Royals game, these guys look very happy to have met Ken Jeong. Ken is known for his roles on Community and in the Hangover franchise, which is where they seemed to recognize him from. Or, at least that’s what they thought. Ken responded to the picture to inform them it wasn’t him. This was a bad mistake, made a million times worse by actually being published in a real magazine. 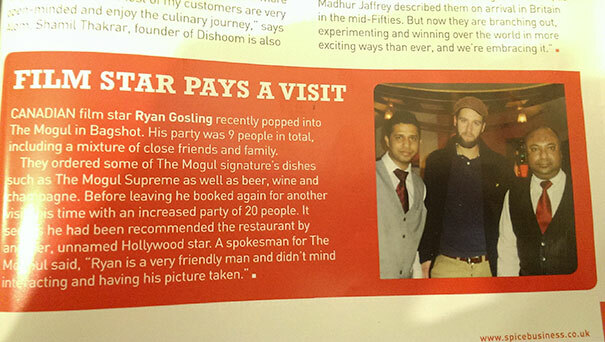 It was believed that Ryan Gosling showed up at The Mogul in Bagshot with nine of his closest friends and family. A slightly closer look shows that this is obviously not Gosling. Here we have more of a case of a stolen identity kind of thing. 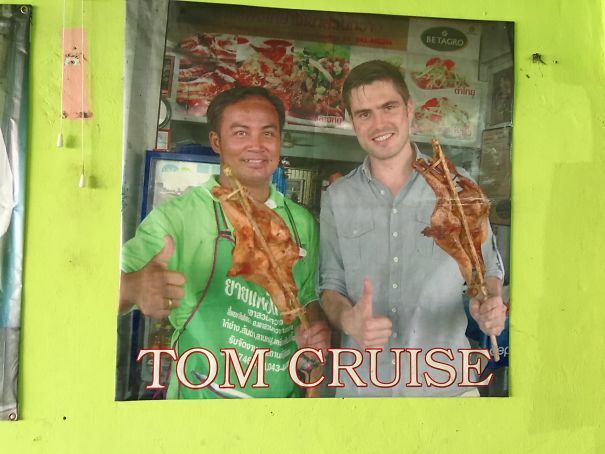 While visiting northeast Thailand, this dude went to a chicken shop. Either he lied about who he was at the start, or the workers believed he was Tom Cruise. Regardless, he went out of his way to play along with it and take a photo. Considering how wildly popular Game of Thrones currently is, you’d think nobody would make this kind of mistake. Especially someone who considers one of the show’s actresses an “idol.” That’s just what this guy did when he thought he met Maisie Williams. Maisie herself had to call him out on it. 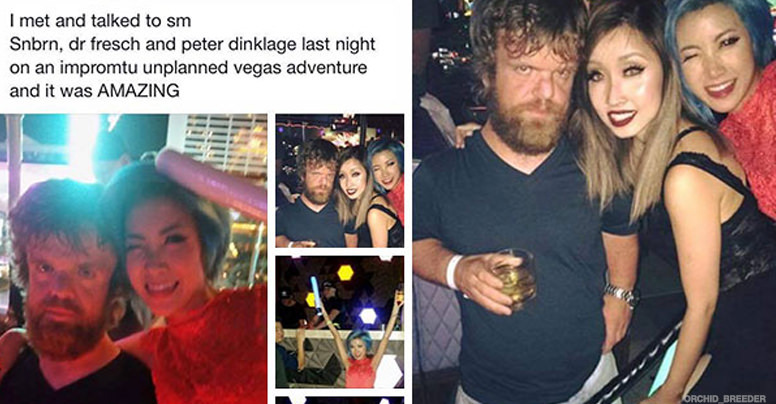 Another case of mistaken identity with a Game of Thrones actor. Again, this one isn’t very close. Though some of the facial features are similar, the hair is way off. 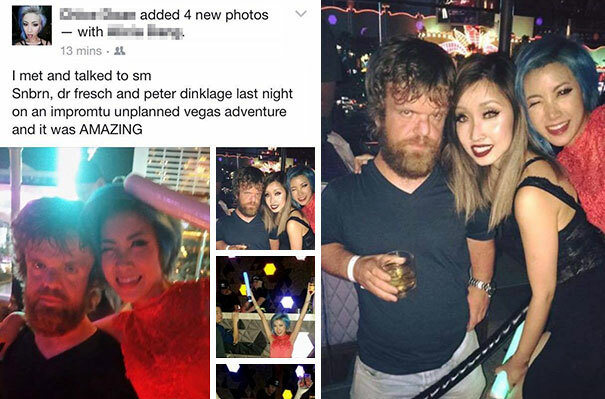 That didn’t stop these ladies from believing that Tyrion Lannister bought them drinks. The Game of Thrones mistakes keep coming, except it wasn’t with an actor this time. Instead, this person was apparently convinced the old man he took this picture with was a series author, George R.R. Martin. Hilariously, it was really a homeless person who tricked this guy after seeing him a few times. Back to Peter Dinklage we go. This impostor doesn’t have the facial features down like the previous one, but his facial hair and shaggy look certainly fit the bill of later seasons of Game of Thrones. Though he took pictures with the girls, he didn’t look too happy about the misunderstanding. 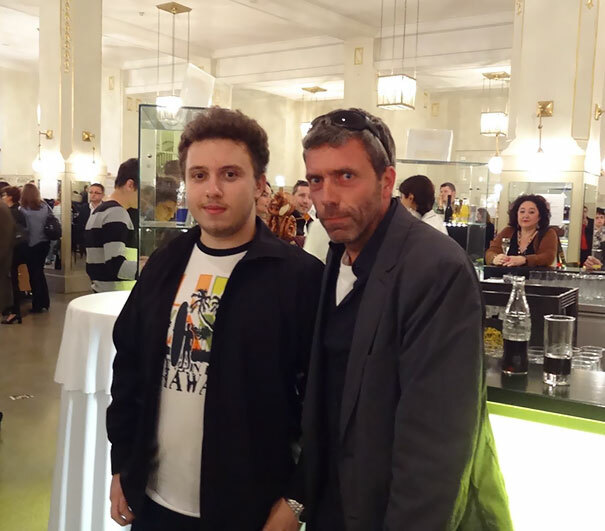 This person thought they met the real life Dr. House. On the hit show, House, the titular doctor was played by Hugh Laurie, who this person assumed he got a picture with. The resemblance is striking, so it’s understandable. Another case of someone mistaking a person for Johnny Depp. He looks more like Depp than the guy on the list earlier. 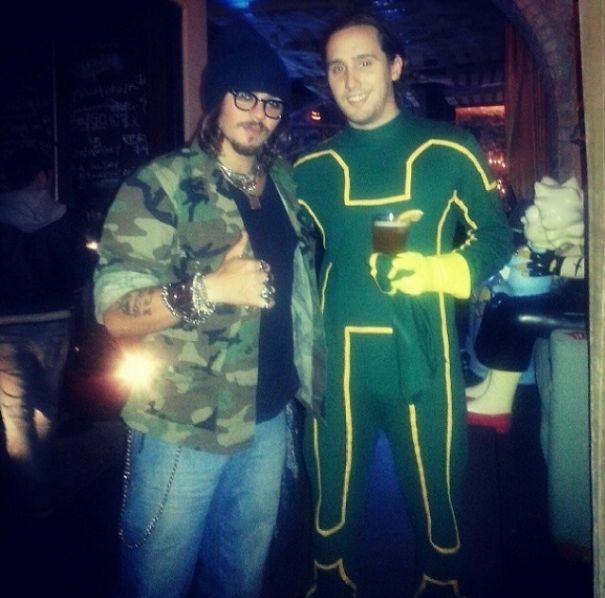 But, given the guy taking the picture with him is dressed in costume, it could just be that this person was dressed as Depp. At the World Cup, this fella thought he ran into one of the biggest movie stars on the planet. 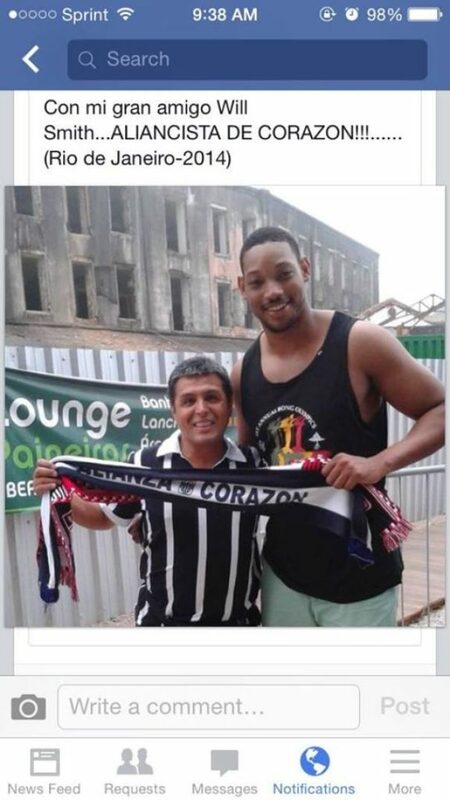 He even stopped to take a picture with the guy, who he believed was Will Smith. I don’t really see it. Oh, boy. This one is far from being even close. 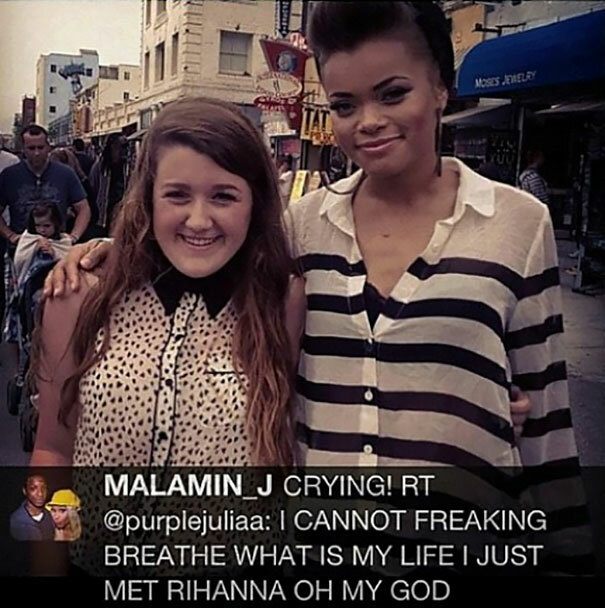 This girl said she was crying at how cool it was to meet and take pictures with Rihanna. Of course, the woman looks nothing like Rihanna, making this one of the longer shot mistakes on here. This guy has a magnificent mustache. 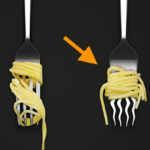 It has no relevance to the picture, it just had to be pointed out. 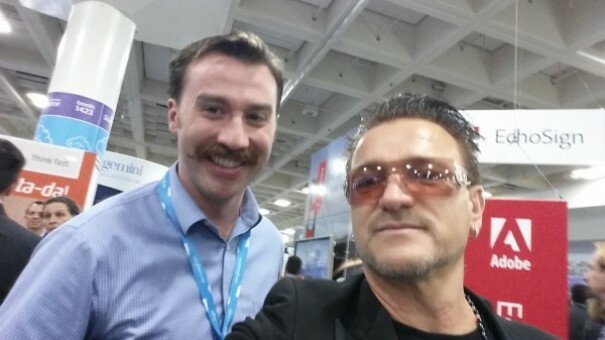 What is relevant is how he thought he ran into Bono and snapped a picture with him at Dreamforce 2013. 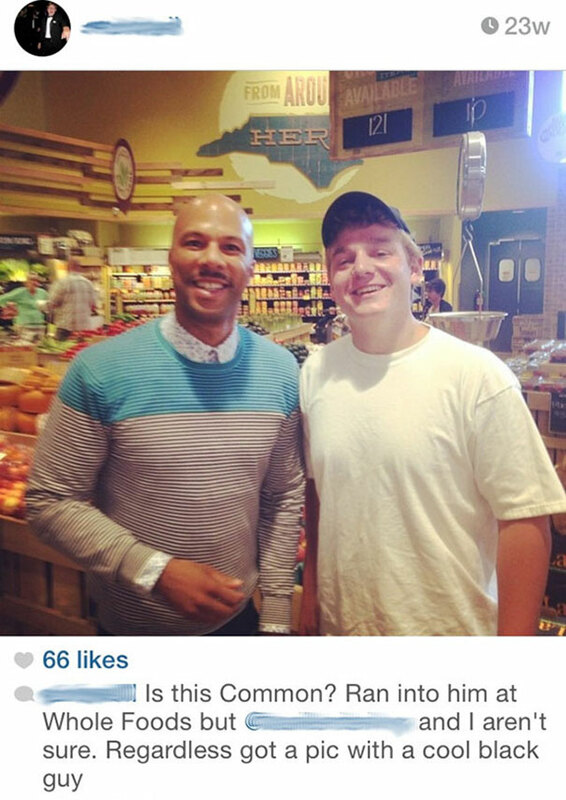 This guy was unsure if he ran into rapper/actor Common. He realized that even if he didn’t really meet a celebrity, he at least got to take a picture with a guy who turned out to be pretty darn cool. It’s kind of embarrassing how wrong this person was. First, they thought they met Bill Murray, which is strange as the guy looks nothing like him. Then, to make things much worse, the guy seems to have a name tag, like he’s working at that store. That’s not exactly where I’d expect to find Bill Murray. We end with someone who had a real celebrity encounter but still managed to make a huge mistake. This person screamed “MATT DAMON” and thought they got a picture with him. However, it was really Mark Wahlberg. Thankfully, he was nice about the whole thing and didn’t correct them.